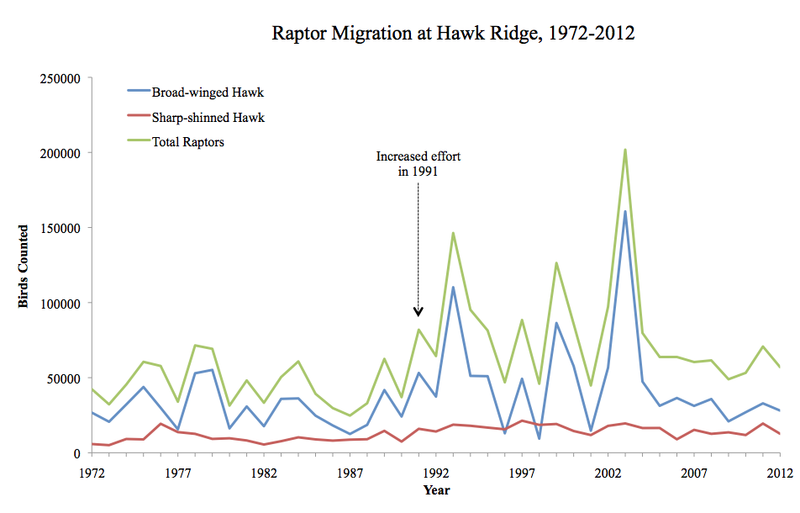 Figure 1: Raptor Migration at Hawk Ridge, 1972-2012. 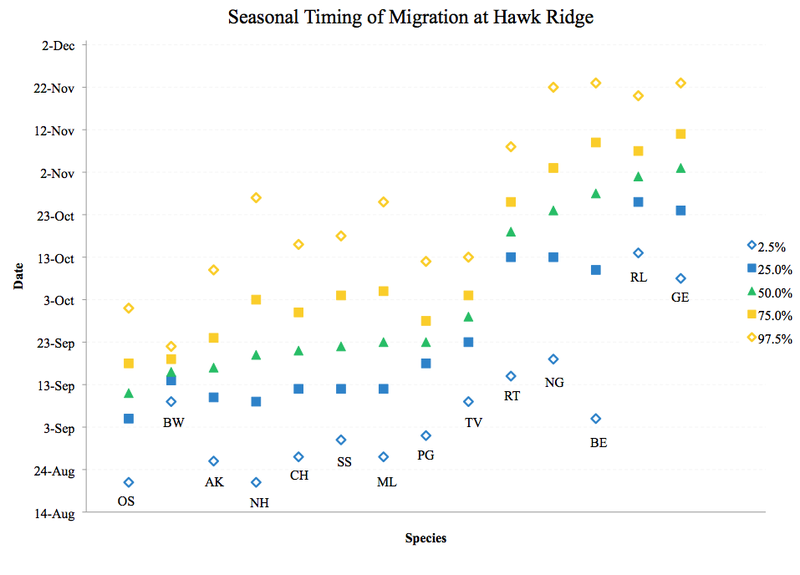 Depicted above are the annual totals of all migrating raptors counted at Hawk Ridge, as well as totals for the two most commonly observed species. With more than 1.5 million birds counted since 1972, the most common migrating raptor at Hawk Ridge is the Broad-winged Hawk. It is clear that the highly variable annual count of this species drives the total for all raptors. Alternatively, the next most common species, the Sharp-shinned Hawk, displays a more stable annual migration past Hawk Ridge. These discrepancies can largely be explained by the differing ecologies of these species. Broad-winged Hawks are one of the few raptor species known to deliberately migrate in large groups, often observed as ‘kettles’ composed of thousands of individuals that usually develop in very specific weather conditions. Conversely, numbers of Sharp-shinned Hawks are much less dependent on weather patterns; they migrate individually, often foraging while they glide directly above the tree-tops. In 1991 the count protocol at Hawk Ridge was modified. In earlier years, only one qualified counter was present and they utilized basic binoculars. However, in recent years there are often as many as three observers working in conjunction to count migrating raptors, usually with the aid of sophisticated modern telescopes. Figure 2: Seasonal timing of Raptor Migration at Hawk Ridge. The timing of a biological event, or phenology, is often difficult to predict. With factors such as climate, annual weather patterns, and a variety of biotic influences working in concert, pinpointing when an event such as the migration of a raptor species will occur becomes quite hard. Here at Hawk Ridge, we have fourteen species that are quite common and the patterns of their annual migration reveal interesting trends. Above is a graph of the average date that different percentages of individuals of each species pass the Ridge. By using a variety of percentages, interesting differences emerge; for example, the average date that 2.5% of Broad-winged Hawks and Bald Eagles pass the Ridge is quite similar, however, the overall pattern of these species’ autumnal migration is dramatically different! Data used for this graphic come from the most consistent observation period within each year (8/15 – 11/30) and between years (1991-2012). OS, Osprey; BW, Broad-winged Hawk; AK, American Kestrel; NH, Northern Harrier; CH, Cooper’s Hawk; SS, Sharp-shinned Hawk; ML, Merlin; PG, Peregrine Falcon; TV, Turkey Vulture; RT, Red-tailed Hawk; NG, Northern Goshawk; BE, Bald Eagle; RL, Rough-legged Hawk; GE, Golden Eagle.